When scooter news breaks, we put it under a tarp in the garage. 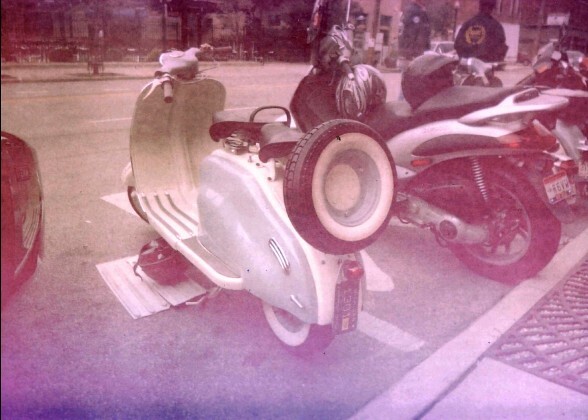 Here’s a fun story and mystery from our pal Karm Parker, a Torontonian who moved to Columbus, OH about a year ago: Karm, like many of us rally-going scooterists, visits a lot of thrift stores and lately he had the idea to steal the film from any cheap cameras he finds. He carries around a few batteries to (hopefully) safely rewind it, and sends it off to Dwane’s Photo to have prints made. In his very first batch, two came back ‘black’ (exposed to light at some point). One roll was too damaged to print. 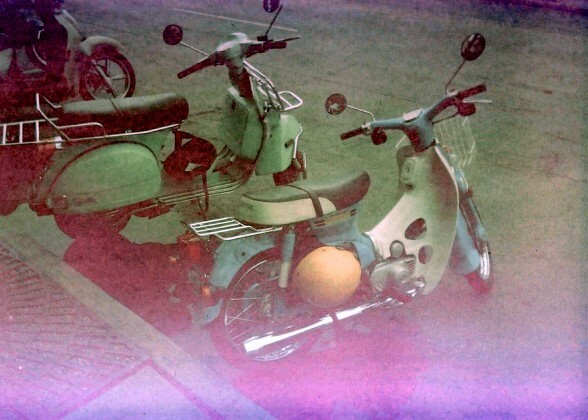 But the last roll had 10 pictures… of scooters! 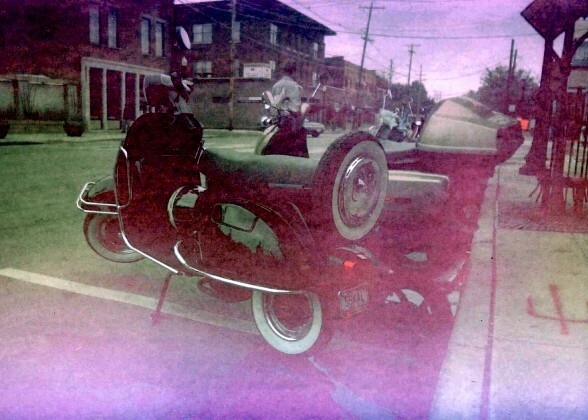 Karm’s not sure where he got this specific roll of film, it was from one of four thrift stores in Columbus. 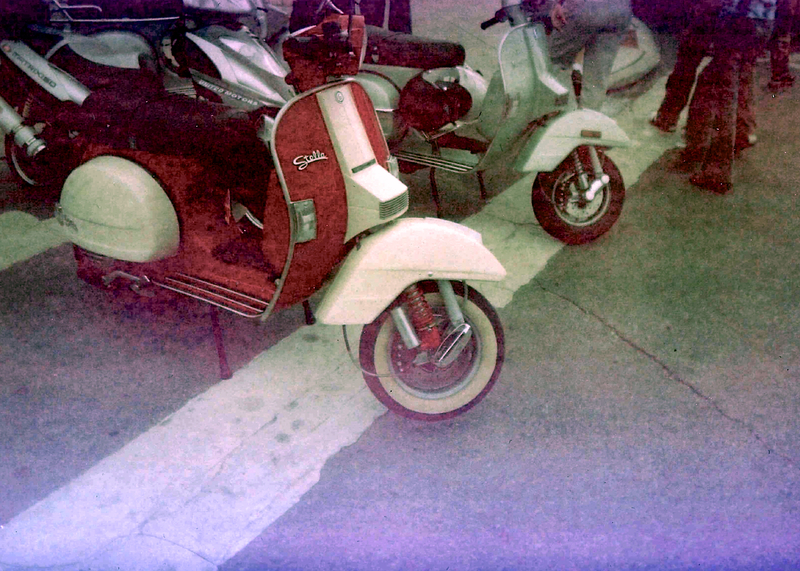 From the clues in the photos, it appears to be a scooter or vintage vehicle rally in 2007. So, historically, maybe these photos are not terribly significant, but the odds of a scooterist coming across another scooterist’s film in discarded camera–and actually developing it–seem pretty slim. 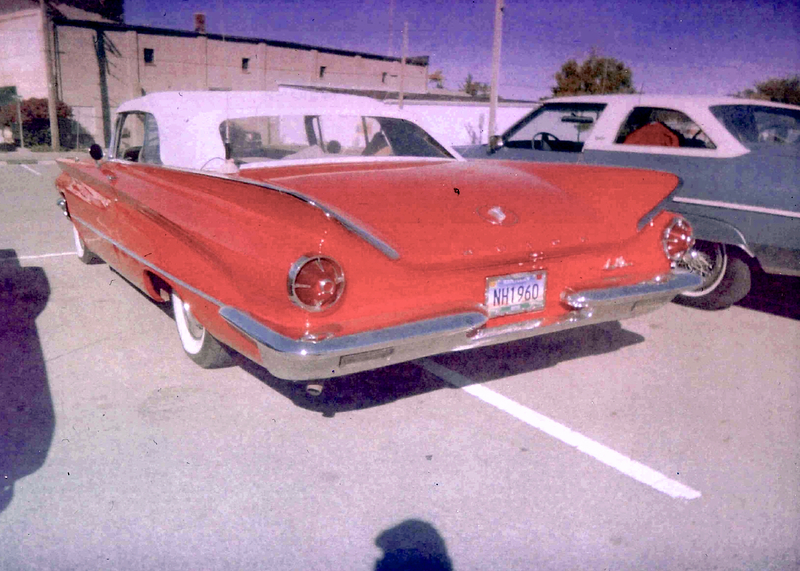 With WKRP coming up this weekend in Cincinnati, Karm wanted to share them online and see if he could find out who took these pictures, when, and where. Though the film was old and the negatives were pretty bad, I was able to clean up the photos a bit, and there’s a lot to work with. Karma’s notes are in bold, mine follow Karm’s. If you recognize anything, post a comment (here or on the 2SB Facebook page, I bet we have it settled by the end of the day! Karm: Shark fighter bike is very familiar. Comical how each face is just blurry enough so you can’t see. In the background there is a store front sign hanging vertical. I cannot make it out though. Anyone recognize this corner? I figure it’s probably a midwest rally, maybe Scoot-A-Que circa 2007? Probably somewhere in the Midwest, at least. It is very funny that literally no one in any of these photos is looking towards the camera. 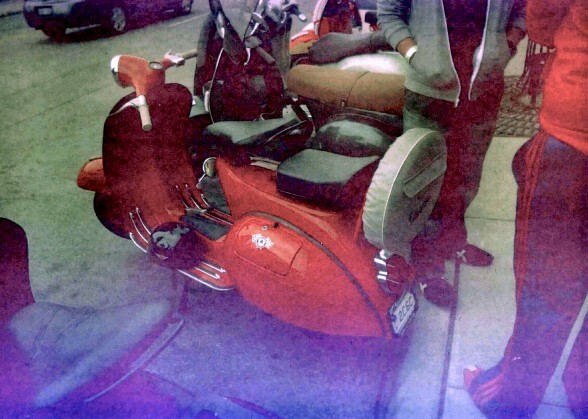 Karm: I think that’s an Ohio plate on the red vespa. Plate “2C6C.” Ace Café sticker on glove box. That’s probably an Allstate, right? 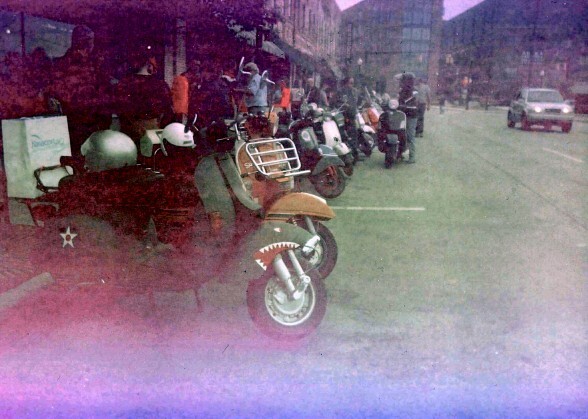 Karm:Black vespa plate 59KAL. Background offers no help as to location again. I’m a bit stumped about what that bike is, looks like a modern P mixed with a vintage Rally. Karm: Fellow in a Rovers SC jacket in the background. 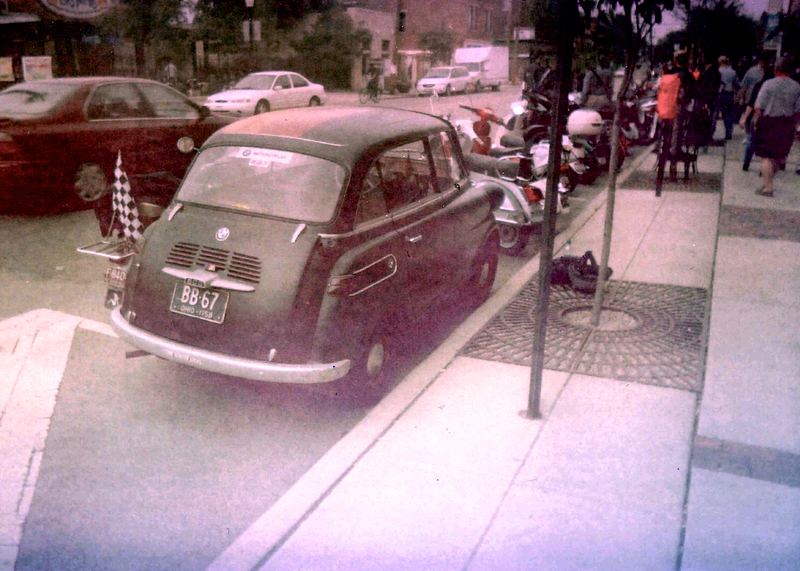 Series 1 plate 1301 – Michigan – and I think the sticker says “10.” Twist and go beside it has a plate of “R6VW” but I think that sticker says “07”. 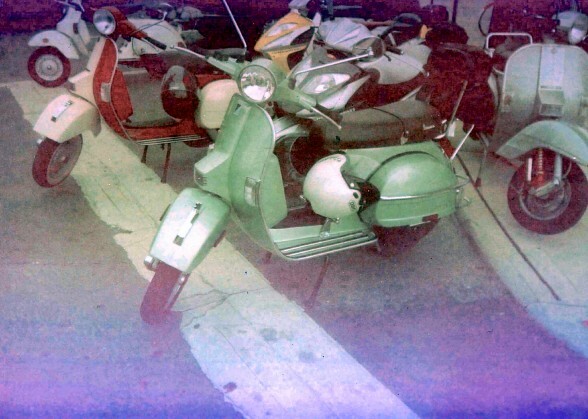 That’s a Lambretta LD Mark II or III, not a Series I, but who’s counting? Same red/white (beige?) Stella as photo 3. Karm: Vespa plate KEED, sticker “07,” across the road is a bar and you can see the first letter or two of the name, I cannot make it out, but that logo is familiar. That’s a BMW 600 (I looked it up). Pretty sweet. Presumably a ’67. Is that Gas Werks on Park Street in Columbus? (Check out their Google reviews!) That would narrow things down quite a bit… I’m feeling embarrassed I never went to Scoot-A-Que. Karm: Fancy Buick. No idea where. Maybe the scooters were at a vintage car show? 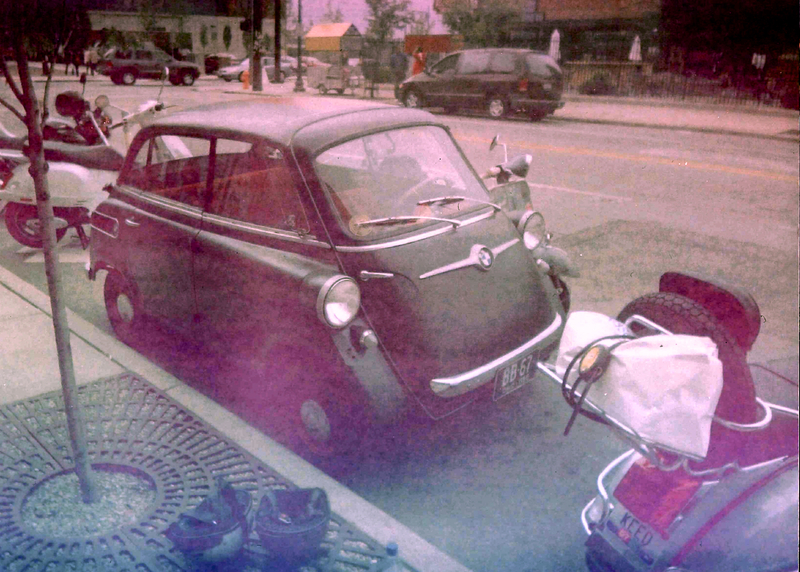 Or maybe these two vintage cars just happened to be nearby? Karm: Cub and a Stella. So there you go folks, let’s figure out this mystery, for Karm, Scootering, and the Internet in general! See y’all at WKRP this weekend!